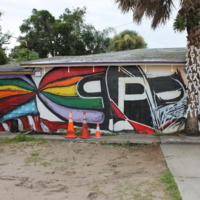 Original photographs of a mural painted on St. Matthew's Tavern in tribute to the victims of the Pulse nightclub shooting. 49 white ribbons, each representing one of the victims, are hung on a palm tree next to the front door. Located at 1300 North Mills Avenue, the building housing St. Matthew's Tavern was once a neighborhood gay bar called Paradise. St. Matthew's Tavern opened in December 2013, featuring a tavern style theme mixed with church pews. The bar allows St. Dorothy's Catholic Community to host Mass every Sunday at 11:00 a.m. The group celebrates "love without judgment flowing from Catholic Apostolic tradition." St. Dorothy's, who is not affiliated with the Roman Catholic Diocese, welcomes members who are divorced, gay or "recovering" Catholic. 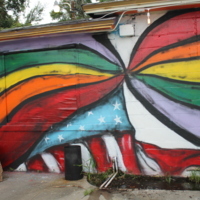 In the early hours of June 12, 2016, an American born security guard named Omar Mir Seddique Mateen shot and killed 49 people and wounded an additional 53 at Pulse, a gay nightclub in Orlando, Florida. Mateen, who swore allegiance to the Islamic State of Iraq and the Levant (ISIL), was shot and killed by the Orlando Police Department after a three-hour standoff. The incident was the deadliest mass shooting by a single gunman in United States history, the deadliest terrorist attack in the United States since the September 11th attacks of 2001, and the deadliest incident of violence against LGBT people in United States history. Most of the victims were Latino, as the club was hosting a Latin Night at the time of the massacre. Original color photographs: RICHES of Central Florida, University of Central Florida, Orlando, Florida. Digital reproduction of original color photographs. Copyright to this resource is held by RICHES of Central Florida for educational purposes only. Sullivan, Erin. "St. Matthew's Tavern offers bar and church in one." Orlando Weekly, December 3, 2013. 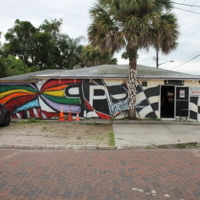 Accessed November 7, 2016. http://www.orlandoweekly.com/Blogs/archives/2013/12/03/st-matthews-tavern-offers-bar-and-church-in-one. Manes, Billy. "How St. Dorothy's lost its chapel and found a home in a bar." Orlando Weekly, January 14, 2014. Accessed November 7, 2016. http://www.orlandoweekly.com/orlando/how-st-dorothys-lost-its-chapel-and-found-a-home-in-a-bar/Content?oid=2242319. Cravero, Geoffrey. “St. 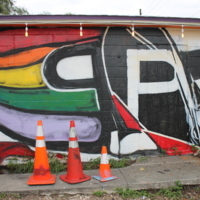 Matthew's Tavern Pulse Tribute.” RICHES of Central Florida accessed April 18, 2019, https://richesmi.cah.ucf.edu/omeka/items/show/9787.